This has been quite a week. Trinity Sunday’s solemn splendor was followed by Memorial Day’s sorrows and joys and parties. Congratulations to all. Corpus Christi’s Eucharistic adoration, the Divine Office and Solemn Mass, allowed us to observe together as priests and faithful the Sacrament which we rightly name “Blessed.” We are now in the blessed days of the Monstrance and Benediction. Others came for First Friday or during the night. We usually get just enough. Today’s grand celebration before the Blessed Sacrament Exposed has its highpoint in First Holy Communion. Jesus abides with us “all days” chiefly so that He may go to the Father in Sacrifice and to the children as Nourishment. But, wonder of wonders, He abides with us day and night in the tabernacle. No wonder we break forth from the church today in solemn procession to express our joy, and give jubilant thanks. Weather permitting, of course. Rain comes most days anymore. Good for the roses, anyway. But the weeds… Thanks, many thanks to our volunteer gardeners who came, are coming, and may yet come to keep beautiful the grounds of your church, with its many shrines. Take a stroll. Ever since April, the hot afternoons overwhelm our air conditioning easily, despite three new units installed the last year or two. It’s a fiery furnace by Vesper time. What went wrong? Mystery. The man was on the roof checking the other day. But it looks as if it will be an-other long, hot summer in the Lord’s service. Thanks are in order this First Communion Day to our Sisters and their catechism teachers for another successful year. We must say the same for the ladies and men (thank you for your persistence, Fr. Cekada) of the choir. What beautiful music is offered up each Sun-day for God’s Glory and our great edification. The good men of the Schola were out in force and sounding strong last Sunday for High Mass and Vespers. The Schola sings through Summer, and we are grateful. I am grateful to the 9 o’clock faithful who traditionally sing the High Mass during the Summer months. 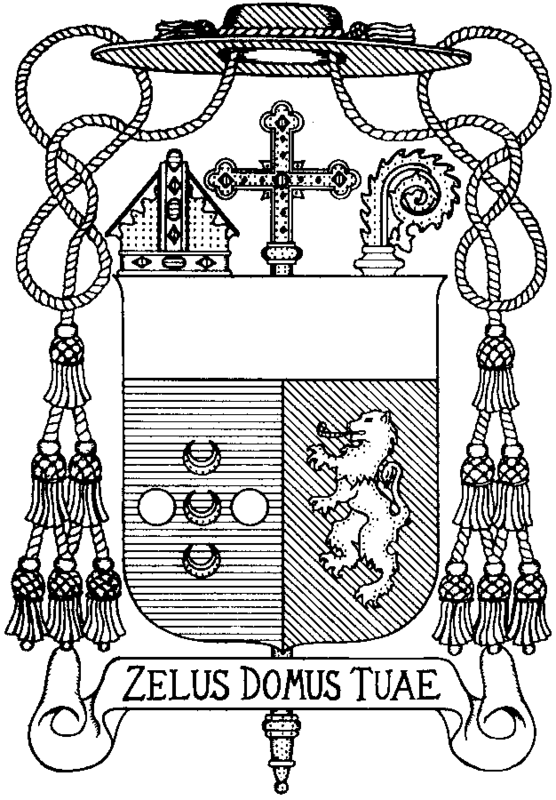 This enables us to continue to solemnize, as we should, the chief Mass of the week, and you and your children to learn and sing the Church’s own mu-sic, Gregorian Chant, as well as so many of our beloved hymns. Who sings, prays twice. Our webcast school High Masses conclude this week with the great feast of the Sacred Heart. But first the full Octave of Corpus Christi continues with daily Mass before the Blessed Sacrament Exposed, and Benediction. We exhaust ourselves in adoration these days, like melted wax or burnt out coal. We ask only for a handful to help, but it sure would be fine to have a churchfull during these special holy weeks we call octaves. Parents, don’t forget the fine tradition of bringing your First Communion children back one day this week to make their Second Communion. What touching thanks this would be. You could even dress them in their white again, one last time. I wish to thank as well our teachers for another fine school year at St. Gertrude the Great. We don’t pay our teachers much, can’t afford to. They’re almost volunteer! But what a service they render. God reward them. He will. Fr. Cekada travels tomorrow to the seminary for his last teaching week. Volunteer, of course. But pretty good teaching. Vocations are our most precious commodity, and anything you do to foster them is reward-ed, sometimes even before our eyes. We hope to have new Fr. Dutertre here for a “First Mass” this summer. The McFathers are off to the missions for Corpus Christi Sunday. 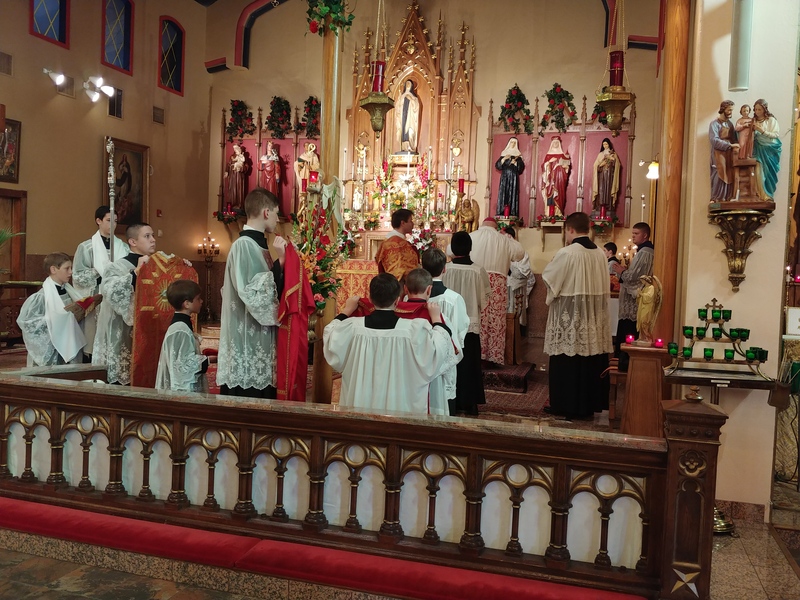 First Communions for Milwaukee to-day as well, and a procession. Fr. Lehtoranta, whose knees seem to be holding out, is offering most of the Exposition Masses this Octave, as he finishes up his teaching year. There, that’s a bit of a news roundup. Come round some time this week and help us pray. OK? May the Sacred Heart draw you. This entry was posted on Saturday, June 2nd, 2018 at 2:33 pm	and is filed under Announcements.